Hughes and Salvidge won a competitive tender process with Homes England to carry out the asset recovery and dismantling works on the former Cross-Channel Hovercraft – The Princess Margaret. The Princess Margaret was built in 1968 by the British Hovercraft Corporation and, along with sister hovercraft The Princess Anne, transported passengers and cars across The Channel until October 2000. They could carry up to 254 passengers and 30 cars each, and were just over 130ft long. However, after falling into disrepair and after being stripped of its four Rolls Royce engines for parts by its previous owners, the current proprietors Homes England decided to tender for the asset recovery, dismantling and removal of The Princess Margaret from site at HMS Daedalus, Lee-on-the-Solent. 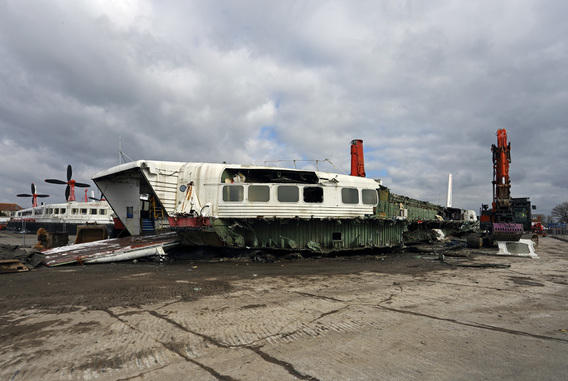 The Princess Anne, being in better condition, was not part of the scope of works and being a feature of The Hovercraft Museum at Daedalus also inherited parts from The Princess Margaret before dismantling took place. Hughes and Salvidge also won the tender on condition we worked with the museum to salvage the cockpit from The Princess Margaret before strip-out and dismantling of the remainder of the hovercraft took place. We also worked closely with a history TV channel to document the two month project from start to finish.